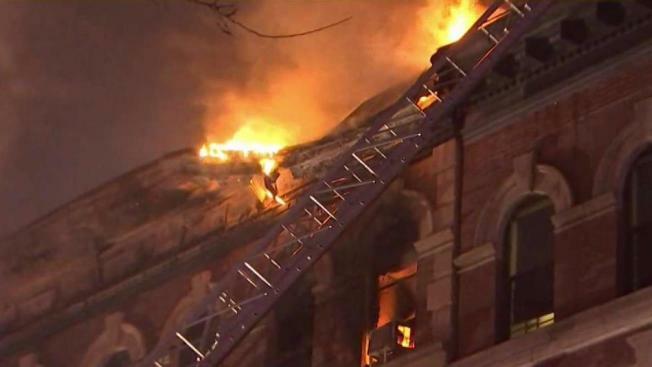 Three firefighters were injured while battling a blaze in the Bronx Monday night as horrified residents stood outside watching their building burn. The flames broke out on the fifth floor on the five-story building on St. Mary’s Street in Mott Haven around 8 p.m. and quickly consumed the top half of the building, according to fire officials. The injuries to the firefighters are believed to be minor. As more than 130 firefighters worked to tackle the fire, residents stood outside watching their apartments smolder. “I’m just praying to God that everything is OK,” witness Miranda Jones said. Inside the 33-unit building lived 32 adults and 16 children, the FDNY said. No injuries to civilians were reported. The fire was sparked on the fifth floor, firefighters said. They believe it started with a stove. It was was extinguished around 10 p.m. The Red Cross is assisting the residents displaced by the fire. Fire crews said the bulk of the damage appeared to be contained to the upper floors.